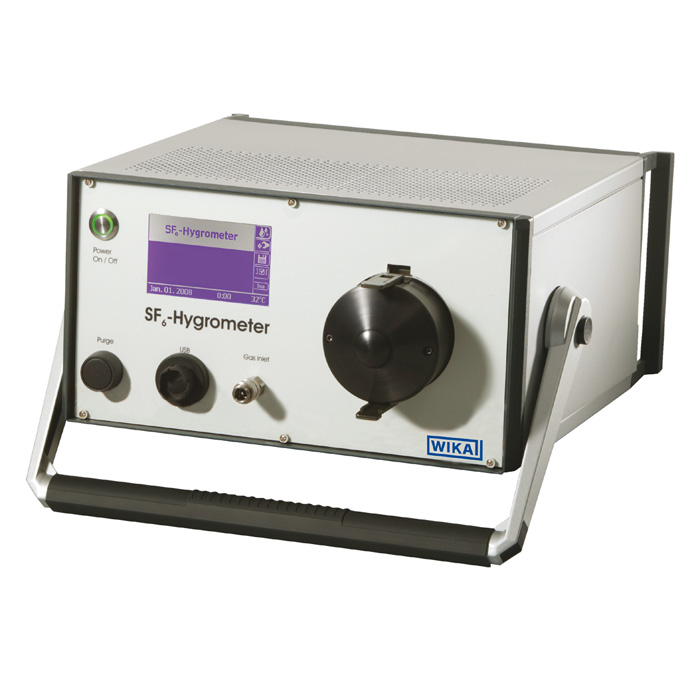 The analysis instrument model GA40 is used for determining the humidity content in SF6 gas with high accuracy. Due to the procedures of filling and servicing switchgear, a residual humidity in SF6 gas is inevitable. However, the concentration of water molecules must be kept as low as possible for guaranteeing a faultless long-term operation of the equipment. The GA40 is a high-end measuring instrument for determining the humidity concentration in SF6 gas quickly, precisely and with repeatable accuracy. The DCC system (Dynamic Contamination Correction) prevents erroneous measurements due to a soiled mirror. The GA40 controls the flow automatically and reproducibly. Thus erroneous measurements due to operating errors are virtually eliminated. Even at the lowest dew point temperatures, the GA40 convinces with its performance and clearly stands out from conventional chilled mirror hygrometers. This is achieved by an adapted control of the cooling element, among other things. Adapters (DN 8, DN 20) required for connecting the GA40 to the respective gas compartment are included in the scope of supply. The solid measuring tube has self-closing quick couplings on both sides in order to prevent the SF6 gas from accidentally escaping into the atmosphere. The test gas can be intermediately stored at the outlet of the GA40 with a gas recovery bag so that the environmentally hazardous SF6 gas does not escape into the surrounding atmosphere. Once the recovery bag is full, the SF6 gas can be pumped back into a gas cylinder using a model GTU-10 gas transfer unit and subsequently recycled or, depending on the gas quality, be reused directly. The internal memory enables the storage of 150 data records. The data can be transferred to a PC via an USB interface at any time.